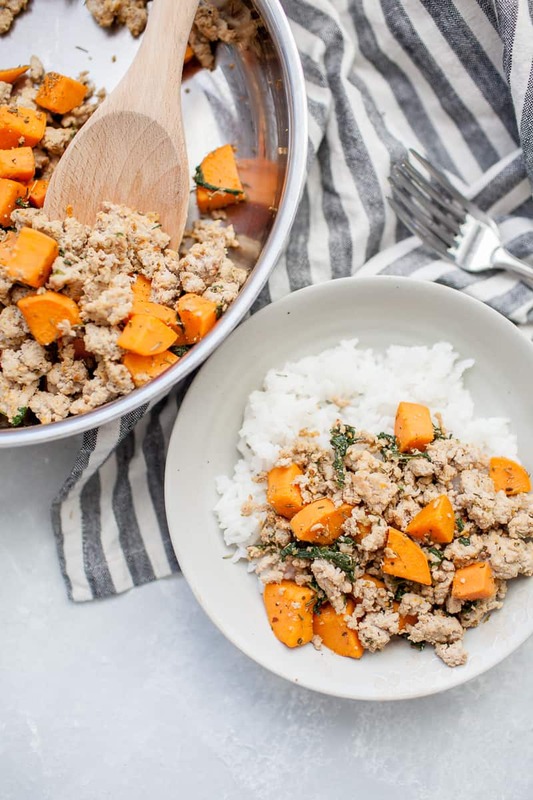 This easy Ground Turkey Sweet Potato Skillet is the perfect weeknight meal for the whole family. It has five simple ingredients and is made in under thirty minutes! 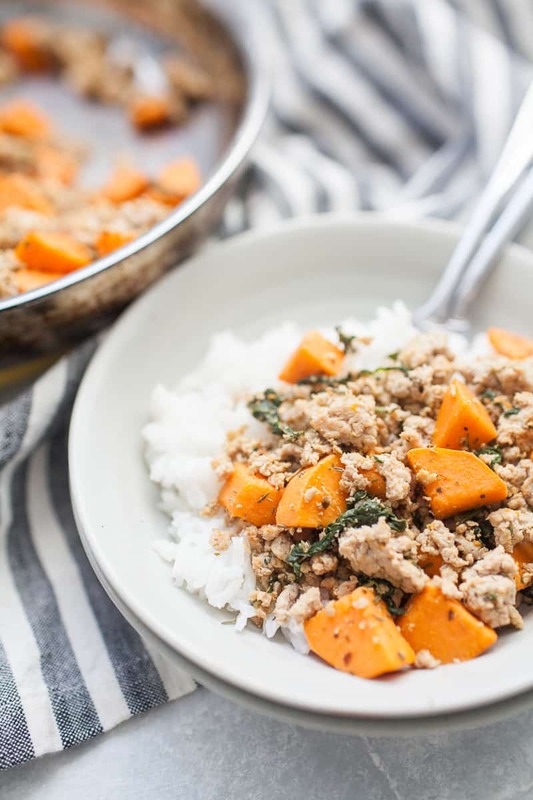 This 30 minute meal is made with ground turkey, diced sweet potatoes, spinach and Italian seasoning. Serve over rice, riced cauliflower, or as a complete meal. It’s also perfect for meal prepping! We’ve all had those moments where it’s an hour before dinner and you suddenly realize you went all day without thinking about that super important question of what’s for dinner? You need something that is quick, takes minimal prep work and that your whole family is going to love. Right? This recipe requires you to peel and chop some sweet potatoes and that’s about all the work you have to do. That means this meal won’t be difficult to make if you have a baby (or dogs) sitting at your feet while you cook, if you need to make it after a long day at work, or if you’re trying to prep ahead for the week to have a delicious, easy to reheat meal for lunch. My boys LOVE sweet potatoes so much that they barely even notice that there is spinach in it. 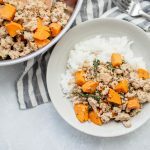 Ground turkey is usually a hit with kids and the seasoning is mild enough that kids will love it too. I’m a huge believer in feeding your kids what you feed yourself and not serving multiple meals for dinner. So this meal is perfect for the whole family to enjoy. Want to include more veggies? Awesome. Do it. Broccoli, brussel sprouts, or peppers would all be delicious. Want to skip the spinach? Cool. No problem. You can substitute another leafy green or skip it all together. coconut aminos? Go for it. 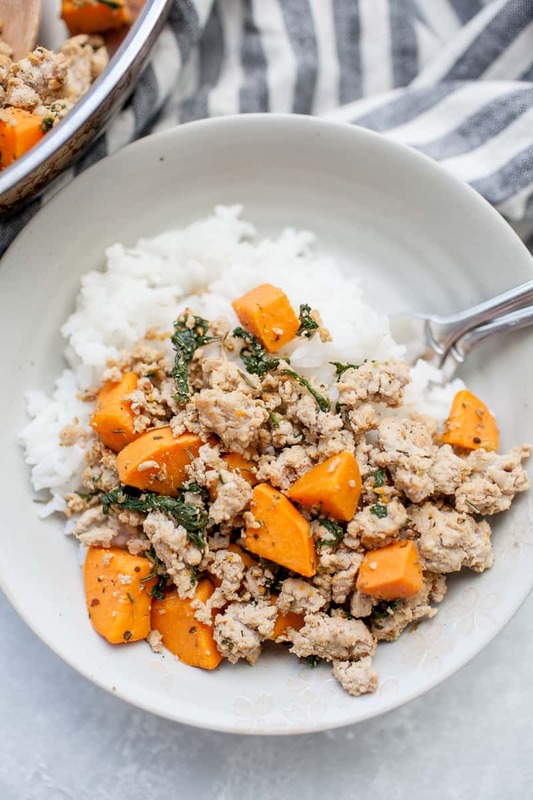 You can make this meal Whole30™ or Paleo by skipping the rice and serving it over cauliflower rice. 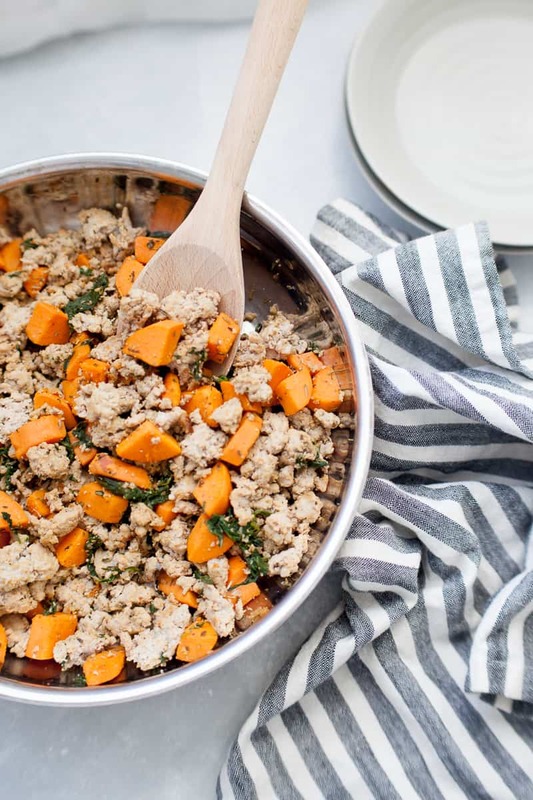 Ground turkey cooks SUPER quickly and the sweet potatoes are cooked quickly because you cover the pan to trap the heat and help them cook evenly. 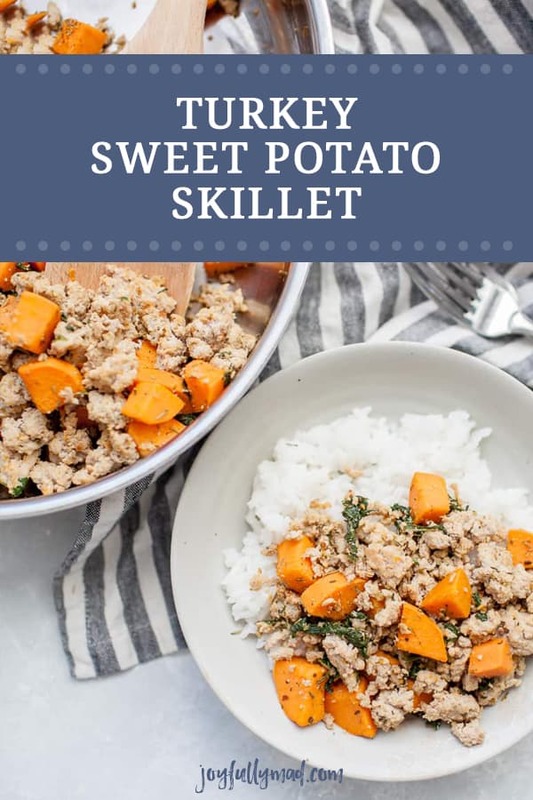 You can easily prep this ahead of time to make mealtime more simple by peeling and chopping your sweet potatoes or just making the whole thing early and reheating for dinner. It’s a perfect meal prep dish because you have lean meat, complex carbohydrate (sweet potatoes), leafy green and a simple carbohydrate (rice). It’s a really cheap meal prepping recipe also. It would cost you under $20 for at least 4 servings of food, depending on how much you portion out. We’ve been making this meal for months now and every time I make it I can’t believe it tastes so good with such simple ingredients and cooking methods. But that’s exactly what we all need to have, simple recipes in our back pocket for crazy (or normal) weeknights. skillet with a lid for this recipe. You want to cook the turkey until it’s completely cooked through (no pink) or has just a touch of pink before you add in the sweet potatoes and spinach. You’ll pour them right on top of the cooked turkey and cover with a lid. Covering the skillet with a lid helps trap the steam in the pan and cook the sweet potatoes. 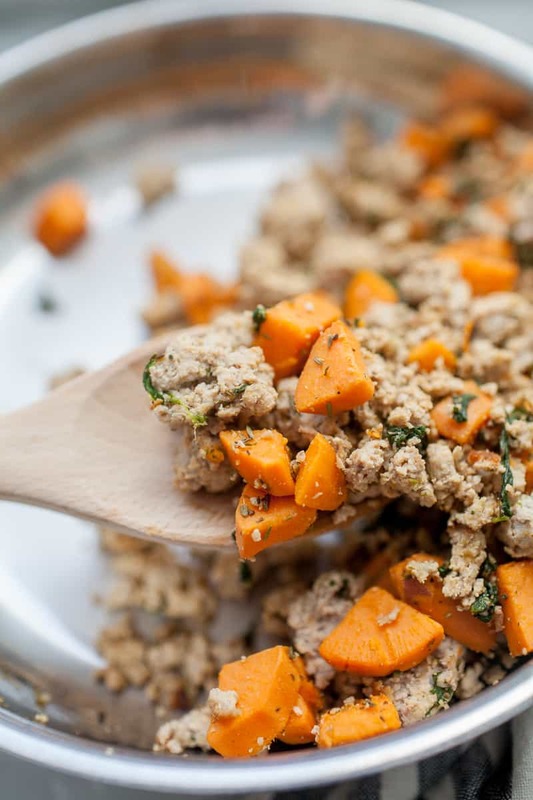 The ground turkey does cook pretty quickly, so I usually peel and chop my sweet potatoes before you start to cook the ground turkey. chop and stir tool to cook and break up large chunks of ground turkey. If you’re using fresh spinach, you may want to add 1/4 cup of water to the pan so that the turkey doesn’t start to burn. If you’re using frozen spinach, the water content from the spinach will be enough to keep the meat from burning and to cook the spinach and sweet potatoes. Peel and dice sweet potatoes and set aside. Start cooking a pot of rice, if serving with rice. In a skillet with a lid on medium heat, add ground turkey and season with salt and pepper. Cook until at least 90% cooked through. 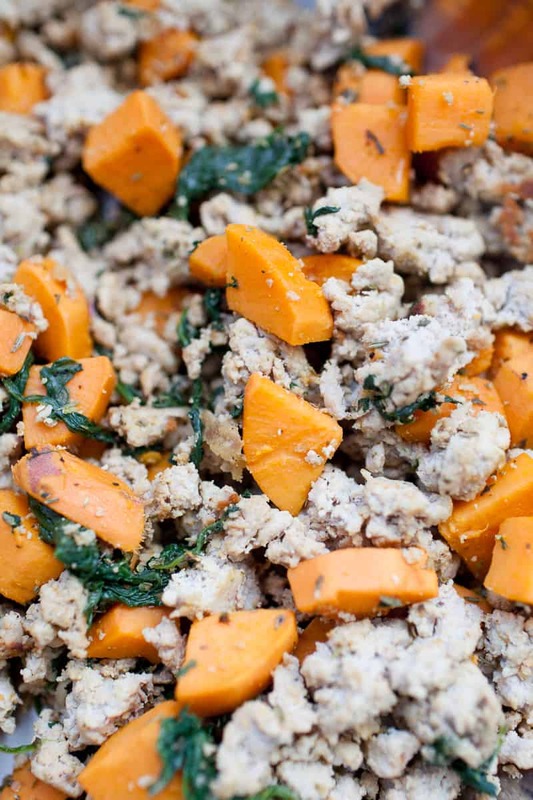 Once the turkey has mostly cooked, add spinach and sweet potatoes to skillet. Add water to pan if necessary (see notes). Cover with lid. Cook for 6-8 minutes, until sweet potatoes are fork tender. 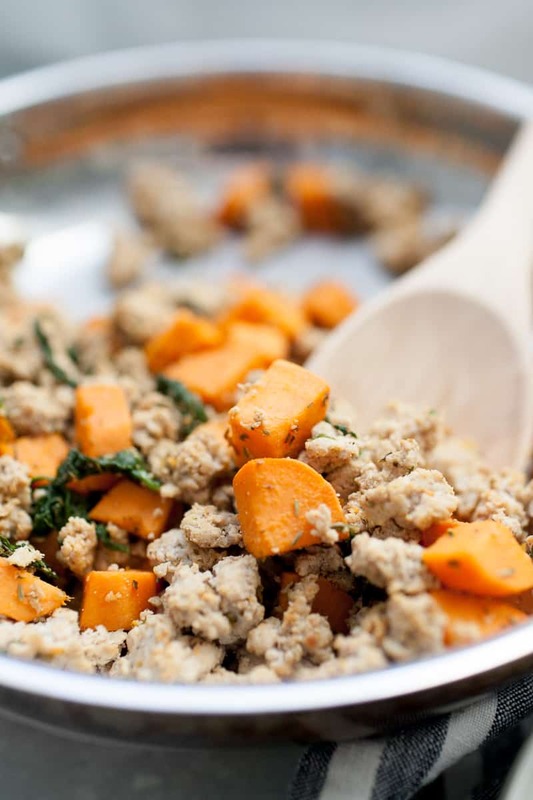 Add spices to skillet and toss to coat, breaking up spinach pieces but being careful not to squish sweet potatoes. Serve over cooked rice or riced cauliflower if desired. You can use frozen or fresh spinach. If using fresh spinach, add 1/4 cup of water to the pan when you add the sweet potatoes and spinach in so the turkey doesn’t burn. Nutrition information includes cooked white rice.